Keep your pets in or unwanted wildlife out. 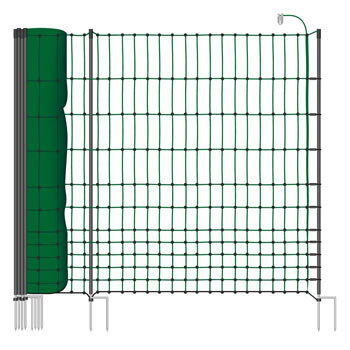 Benefit from our many years experience as a professional provider of fencing solutions. 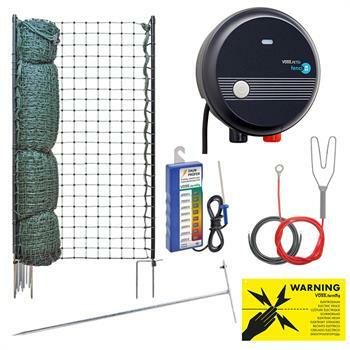 Everything you need for effective and secure fencing. Inexpensive, fully operational straight out of the box. Use the wire above or below the ground to mark the territory where your dog is allowed to go. Flower beds and ponds can be easily excluded. 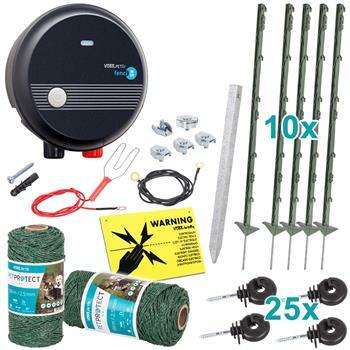 Information about the invisible dog fence you can find here! 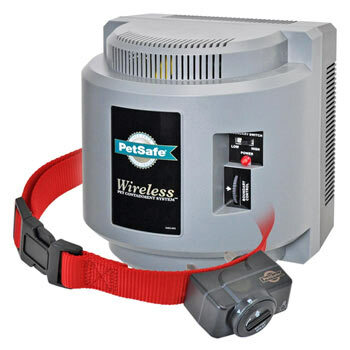 Information about the wireless dog fence you can find here! 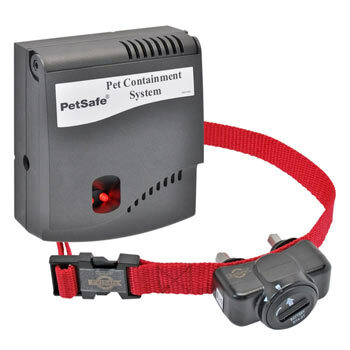 Define a radius of up to 27.5 m from the controller unit where your dog is allowed to go. 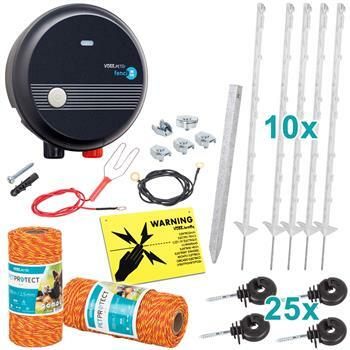 The wireless fence can be used stationary and on the move. suitable against herons, hares, roe deer, otters, foxes, etc. Also suitable for very large properties! Dog fence for large and difficult dogs weighing approx. 20 kg or more. The corrective shock levels on the receiver can be adjusted beforehand. With vibration and audible warning sound. The latest version is available from us for immediate delivery. 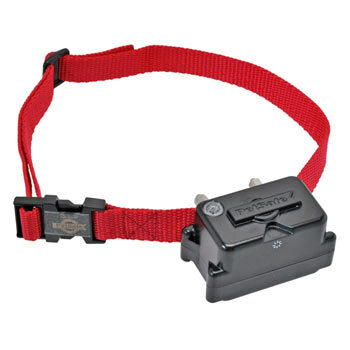 Compact collar with 4 adjustable levels of corrective shock and 1 mode with just the warning sound. 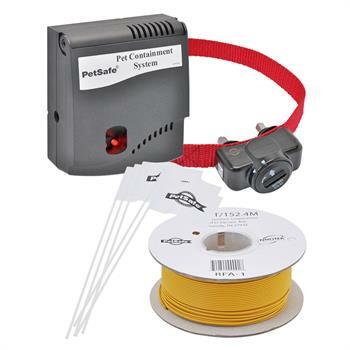 Can be combined with all PetSafe fences. 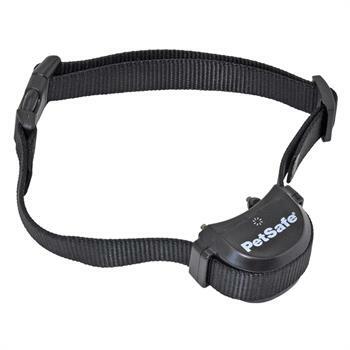 Strong receiver collar for large and difficult dogs. Before giving a corrective shock, the device emits a warning sound and vibrates. 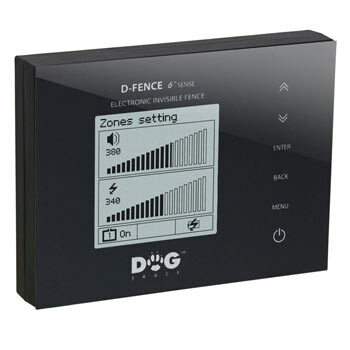 Wireless fence system, also suitable for mobile use. A maximum range of 27.5 m on each side. Can be installed very quickly, with warning sound. 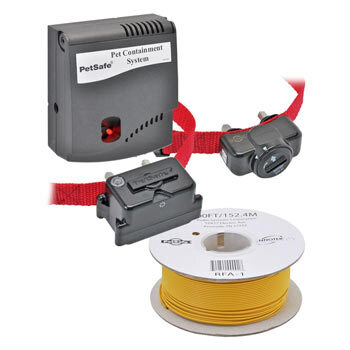 Replacement receiver for the cable-free dog fence. 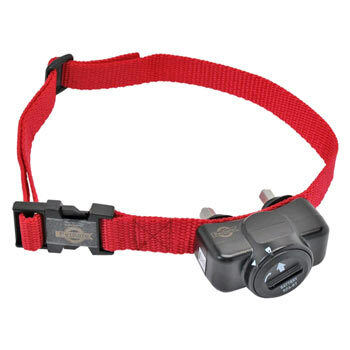 With adjustable correction levels on the collar. Humans have been using fences since the beginning of time to separate “mine” from “yours”. Fences ensure a sense of belonging and make this visible for outsiders. One of the main aims of a fence is to ensure ownership. Safety is based on various levels, and these levels may vary for everyone. Safety for dogs means giving them a lovely space to exercise in without the dog owner having to worry about anything happening to them. Dogs need to be able to live out their urge to play without being bothered by a neighbouring dog or other stray animal which could end up in a territorial battle. In the countryside, these potential conflicts are less likely to occur due to the existing physical separation and large spaces to run around in. 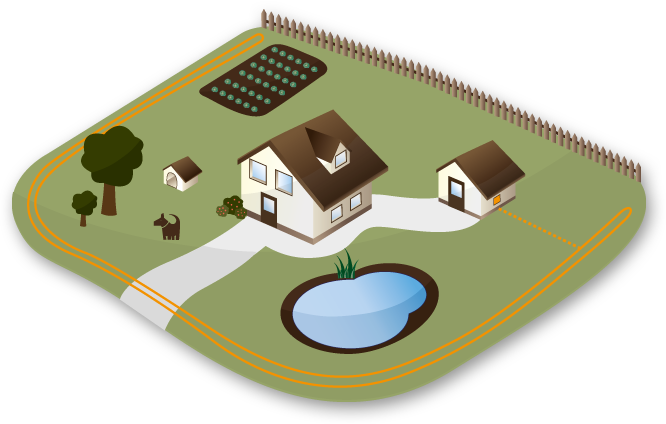 The countryside has less traffic, larger areas to play in directly in front of the house and far fewer potential hazards to worry about. Visits from wild animals is a factor more likely to play a role here. However, this advantageous situation is unfortunately not the standard case. In small spaces, in order to ensure a safe and comfortable area to exercise in, a garden fence for dogs is often the only solution. 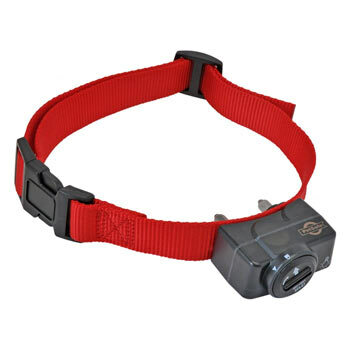 It improves the dog owner’s quality of life and also that of their four-legged friend. Everything inside the dog fence should stay put. Everything outside the dog fence should also stay put. This is often the understandable desire of dog owners. To help you realise this wish, here is a brief overview of the three well-known garden enclosures for dogs. The traditional garden fence for dogs, the invisible dog fence and the electric fence for dogs in all its three variations. When considering each type of garden fence, we will underline the respective advantages for your dog and compare them for you. Most people will be familiar with the traditional garden fence for dogs. Usually, this type of fence was not erected especially for a dog, but already existed when you moved into the property. Or if you chose it yourself, you did not necessarily do so with your dog in mind. Traditional garden fences can vary greatly in terms of materials, size and stability. Some are well suited for use as a dog fence while others are not so suitable. Accordingly, the purchase price also differs enormously. For instance, the well-known wooden lattice fence is available from DIY stores for a few Euros per metre. Then there are luxurious hand-forged fences which cost as much as a small to medium car. It’s up to each person to decide whether they consider a fence as a design-related feature or as a purely functional object. However, all of these types of dog fence share the same basic characteristic. They form a visual, and therefore a mechanical, barrier. Depending on your dog’s agility, he will be easily able to dig under a fence of this height. This can of course be prevented, if, during the preliminary stages, the bottom of the fence is sunk into the earth by up to 50 cm – however, this is seldom taken into account during the planning stage – perhaps also due to the fact that the costs for doing so are not exactly cheap. In general, dogs can jump over this type of fence. Anyone who’s ever seen a dog jump over a fence, knows exactly how much energy and power a dog has. Finally, there are also dogs who go to great lengths to climb over dog fences. Over recent years, the invisible dog fence has become an extremely popular garden fence for dogs. The original invisible dog fence was developed in the USA, where it has long been one of the traditional types of dog fence used. At the start of the 90s, this fence was circulated globally and is now also manufactured by other companies in addition to the original American company. 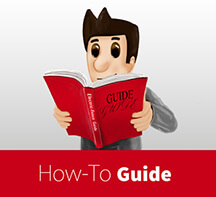 Extreme differences exist in terms of the quality of the different products. These are apparent, on the one hand, in the fence’s workmanship and, on the other, in the specific functions which make the fence extra safe. 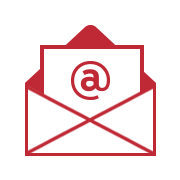 These functions include the possibility of setting up a separate warning area. 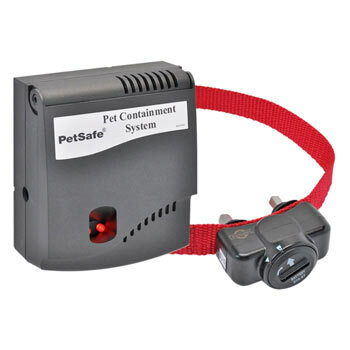 The system should also be equipped with waterproof dog collars. This is where the wheat is often separated from the chaff. Many suppliers hide the fact that they do not offer this by using terms such as “water-repellent”, “splashproof” or otherwise they don’t mention this characteristic at all. When making your choice, pay attention to this factor. Depending on the equipment, the price for a high-quality system is between 160 and 250 euros. Another quality characteristic to look out for is whether or not the manufacturer is a member of the CSMA. This is an internationally recognised association of manufacturers of dog training products which are vigilant about particularly high animal welfare standards. Any old dog fence manufacturer cannot simply become a member of this association. The invisible dog fence is a garden fence for dogs which operates without any visible mechanical barrier. So the question is: how does the system work? A thin antenna cable is laid in the ground (can also be mounted above the ground). This antenna cable forms the invisible dog fence. 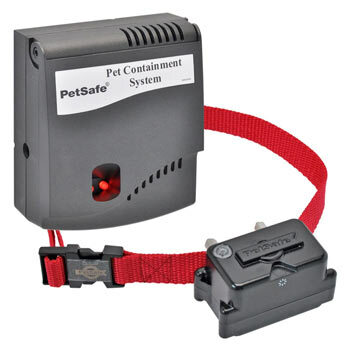 The dog itself wears an additional collar equipped with a receiver which can emit various corrective and warning signals. The success behind the system lies mainly in conditioning your dog by a negative experience. This occurs if your dog tries to overcome the invisible dog fence. The invisible dog fence works with two areas which are fundamental for this training method. These are the warning and punishment areas of the invisible dog fence. When training your dog, the dog will soon learn which are the areas that it may no longer enter. 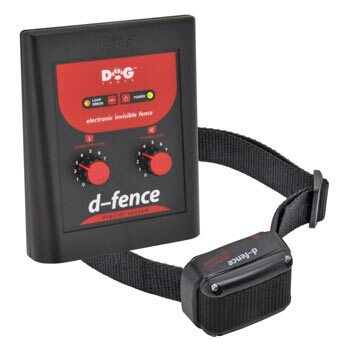 The invisible dog fence’s warning area triggers a warning beep emitted by the dog’s collar. Through training, your four-legged friend will learn that he must not keep going through this area if he doesn’t want to be punished. 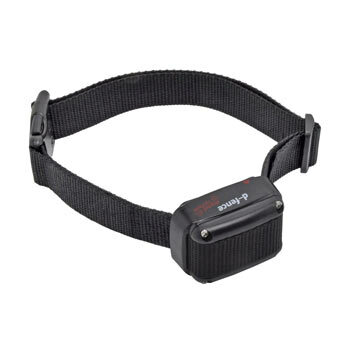 The invisible dog fence’s punishment area triggers an electric impulse on the dog’s collar. This is unpleasant enough to ensure that the dog will not want to experience it again. However, when training your dog, this area must be entered so that the dog will associate the conditioning punishment with the barrier. This invisible dog fence has become a very effective garden fence for dogs. With the right training, the conditioning is virtually perfect. Thus, you have a dog fence which gives your dog a safe place to exercise in the restricted area that you have enclosed. The obvious disadvantage of this system is that there is no mechanical barrier. Consequently, although your dog cannot escape from the defined area, other dogs and animals can get in through the fence. This is a clear weak point of the system. For this reason, this dog fence is often used as an additional system with a traditional garden fence. This combination will ensure far greater safety. 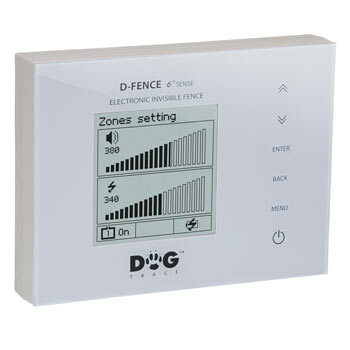 In sum, the invisible dog fence is a system which is comparatively affordable and provides a high degree of safety. The dog cannot leave his exercise area, which is one less worry for the dog owner. However, there is still the problem that other dogs can enter the area. If this is not a problem for you, then this fence will provide you with an optimum garden enclosure for your dog. It is also possible to incorporate this fence in an existing garden fence system for dogs with little effort. This is precisely what makes the invisible dog fence particularly interesting. 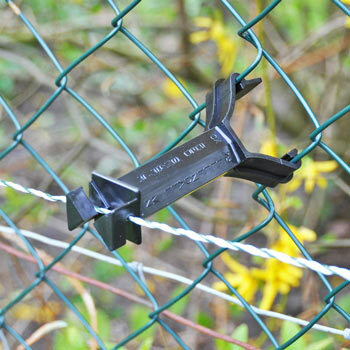 The electric fence for dogs is a further development of the traditional electric fence which has existed for decades in Europe. The effectiveness of this type of fence is undisputed, and it is not without reason that professionals from the agricultural sector make use of it. If it’s possible for such a system to easily and safely keep a herd of cows or horses apart, then there should be no difficulty in using this system as a garden fence for dogs. 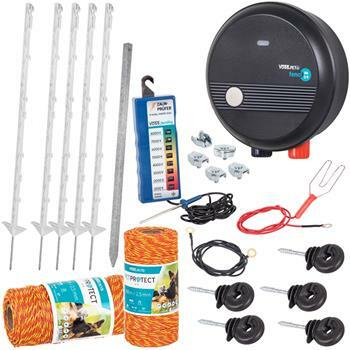 The basic type of electric fence for dogs is a combination of a mechanical and a conditioning barrier. A mechanical barrier because it contains visible conducting material which, depending, on the version, can be seen as a simple way of conducting the electric impulse as on the electric fence, or used as an interwoven network similar to a football goal. A conditioning barrier, because if you touch the fence, you will receive an electric shock. This is unpleasant enough to ensure that the animal will avoid repeating the experience at all costs. Many different variations of the electric fence exist. 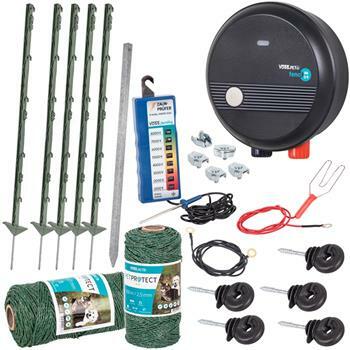 There are mobile dog fences, dog fences with electric posts and also permanent fences. The mobile dog fence is basically an electrified net which is connected to electric fence posts. The real advantage of this garden fence for dogs is that it can be set up extremely quickly. You just have to unroll the net and stand it up. This gives you an instant mechanical barrier. After electrifying it with an energiser, you then also have the conditioning barrier. This is one of the reasons why this system is so popular with holidaymakers in particular. Whether camping with a caravan or in a holiday home, this garden fence for dogs is a quick and flexible solution for providing your dog with a safe place to exercise. You can also use the mobile dog fence as a garden fence for dogs. 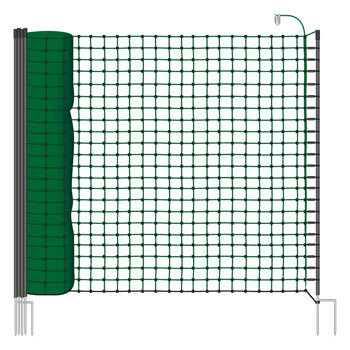 The mobile dog fence is available in various different colours. It comes in inconspicuous fir green, black, orange or even in yellow. Depending on the environment in which the fence is used, the advantage of the coloured variations is that the visibility of the fence can be considerably increased with the use of contrasting colours. This helps the fence to be perceived as a visual barrier. Mobile dog fences also vary in height between 65 and 170 cm. This means that you can choose the right height for your dog. Mobile dog fences also vary in the width of the individual meshes. 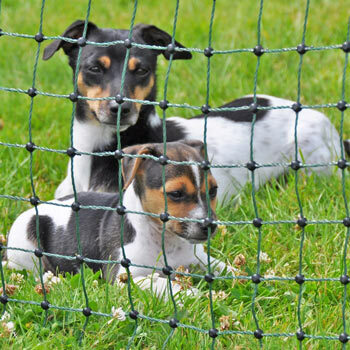 So, if you need a safe garden fence for puppies, you can use a fence with a smaller mesh width of 5 x 5 cm. Based on electric fence posts, the electric fence for dogs enables you to easily erect a permanent garden fence for dogs. Unlike mobile dog fences, this type of fence offers you greater constructional flexibility. You can work independently of the mobile dog fence’s mesh specifications. You can also adapt the fence optimally to the animals’ height, including in difficult conditions and on uneven terrain. Unlike traditional garden fences, with this type of garden fence for dogs, it’s not possible for the animals to dig under the fence. If he tries to do so, your dog will receive an electric shock. Jumping over the fence is not a realistic option for your dog either. As the dog will relate the conditioning via the shock that he has experienced to the entire fence. The dog will thus associate the whole fence with his negative experience and keep away from it. The extra accessories also help to make this version extremely flexible. 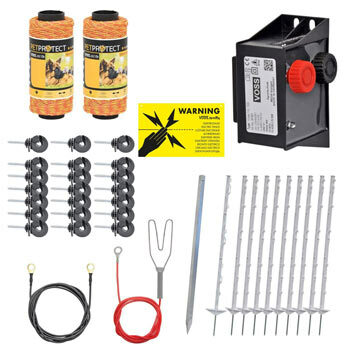 A very wide range of accessories is stocked for electric dog fences. It is for this reason that professionals from the agricultural industry tend to use this type of fence. As a consequence, materials are used which comply with professional livestock farming standards. Therefore, you can be sure of the high quality and durability of these products. Garden fencing for dogs promises a high level of flexibility without losing out on safety. Both types of garden fence for dogs mentioned are optimally suited if, for example, you rent your property. You can mount the dog fence according to your needs, however, there is always the option of removing the fence without leaving any lasting traces behind. 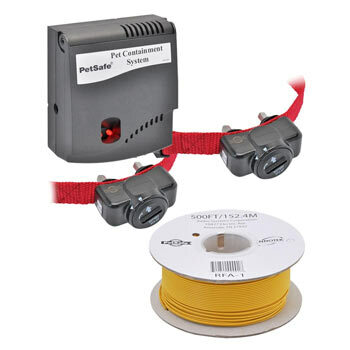 As a result, both systems are extremely popular with customers. The permanent fence for dogs combines garden fences for dogs with the advantages of an electric fence. Basic systems based on Octowood wooden posts, recycled posts and Z-posts are popular permanent fences. This electric fence for dogs is a type of fencing which, once erected, lasts for many years. This long durability is also reflected retroactively in the purchase price. The price is significantly higher than that of a mobile electric fence. However the price pays for itself if you take the long service life into account. The quality too corresponds to the high standards of the electric fence. These are products used by professionals from the agricultural industry. More effort is involved compared to the systems described earlier. However, this is justifiable given the length of time that such a system will remain in force. 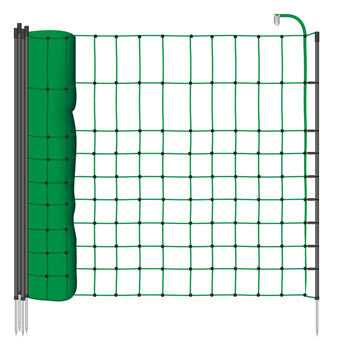 As with the electric fence for dogs, with this dog fence, a safe area for the dog is created through the combination of a mechanical barrier and the electric shock conditioning aspect. Other animals cannot enter the area any more than your four-legged friend can leave it. This type of garden fencing for dogs is a permanent solution and, due to the high quality of the dog’s exercise area, makes a statement for quality, safety and durability. To summarise, we can say that a garden fence for dogs provides safe fencing. Dog fences are based on various safety aspects. For instance, there is the purely mechanical garden fence for dogs, the conditioning, invisible dog fence, the mechanical conditioning electric fence for dogs in its mobile version, electric fence posts and the permanent fence. All of these types make it possible for the dog fence to be used as a barrier. However, the purely mechanical fence has been identified as inadequate where preventing animals from escaping is concerned. On the other hand, it’s difficult for dogs to escape through the other two types of garden fences for dogs mentioned. Similarly to the traditional dog fence, the invisible dog fence exhibits weak points with respect to other animals being able to get through it. However, this aspect may be considered of minor importance depending on the circumstances. If intrusion by other animals is an additional problem for you, an electric fence for dogs would be the better solution. With this type of fence, in addition to preventing your dog from escaping, you can also be sure that other animals cannot get into the garden. It would therefore appear that your desire to have a safe dog fence can be fulfilled by the various different types of garden fencing. Now you just need to select the one which best suits your demands and requirements.